Amazon ‘follows’? – when did that happen? Okay, I admit I can be a bit unobservant at times but seriously, when did Amazon make it possible to follow your favourite authors [and have fun doing it]? I have to assume the Amazon follows happened sometime after the purchase of Goodreads because the concept is like a mashup between how Goodreads allows you to rank your favourite books and Amazon’s own, recommendations. 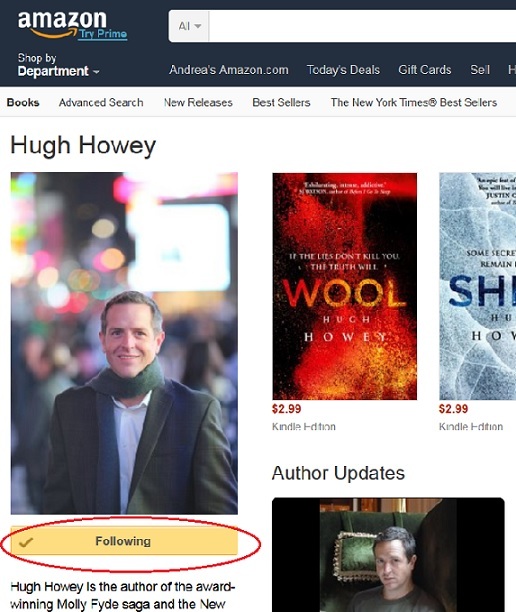 As soon as you click ‘follow’ on one of the authors, you are taken to a sub-page where authors similar to that first one are displayed. One click leads to another, and you suddenly look up to realise you’ve spent close to two hours clicking away and cudgeling your brain for the names of authors from the mists of time. I cannot lie, I really, really enjoyed myself. 🙂 Not only did I get to go down memory lane with my favourite authors, past and present, but I also found myself jotting down the names of unknown authors [supposedly] similar to one of my favourites. This means I have new avenues to explore and at least the potential of discovering new favourite authors. As an avid reader, I like that. Did you notice the heading at the top of the page? 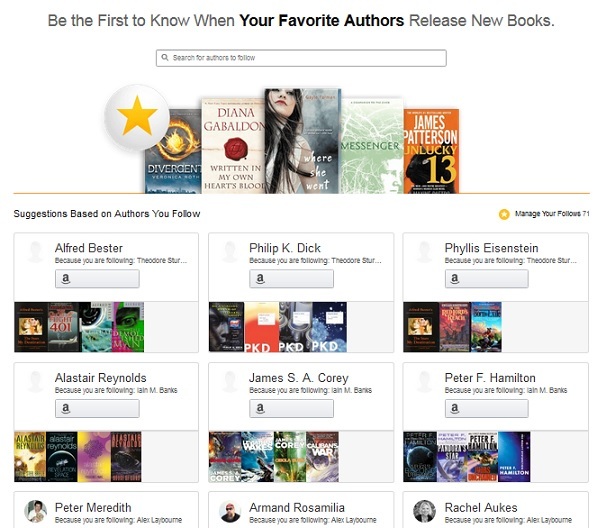 Be the First to Know When Your Favorite Authors Release New Books. That was not there just for show. I fully expect to receive newsletter recommendations based on every new book being published by every author I have followed. And that is a good thing. As Indie authors, we are regularly told to build email lists so we can let our fans know what we’re doing, and when we’re bringing out something new. It’s good advice, but I never have sent out newsletters [and probably never will] because I know what I do with most of those newsletters. Sorry, but unless you are one of my absolute favourite authors, I won’t read your newsletter. There are not enough hours in the day. My personal time management issues aside, however, I love the idea that Amazon, for it’s own benefit, will do something I am incapable of doing for myself – i.e. spruiking my next novel. Of course that assumes that some of you will -cough- follow me -cough- so Amazon has someone to send a newsletter to…. Anyway, moving right along, it’s a great idea and I’ll certainly be going back to add more follows. I think I’m up to about 71 already, and most of those are straight out of my Kindle and Kindle Fire. My next step will be to go through my bookshelves, pen and paper in hand, writing down the names of all the old authors I’ve missed – Alfred Bester, Asimov, Connie Willis, Dostoyevski, Dickens, George Eliott, Sir Arthur Conan Doyle….